The holidays are over and while it was fun to get dressed up and wear shiny makeup, we're just as happy to bust out the cozy sweaters and hygge until spring. But don't put away all of your sparkles just yet: Glitter was everywhere on the spring runways and we don't mind one little bit. 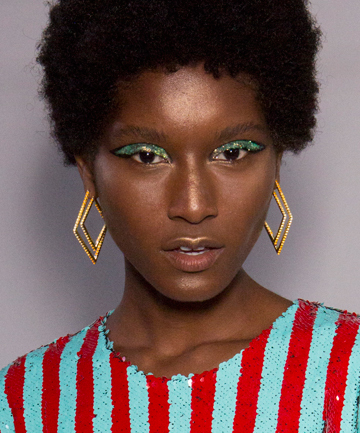 Unlike the full face glitter seen at Giambattista Valli last fall, the look for spring is totally wearable. With the focus on one feature, making a big splash and leaving the rest of the face undone, it's fresh and gorgeous — just like spring.